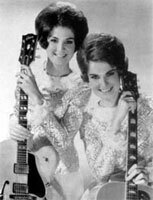 Duo Country US du Missouri comprenant Marcy Cates & Margie Cates. Elles ont enregistré aussi sous le nom de "The Gates". 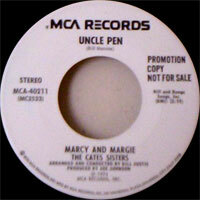 US Country duo from Missouri including Marcy Cates & Margie Cates. They also recorded under the name of " The Gates ". 1976 SP CAPRICE 2024 (US) Mr. Guitar / ? 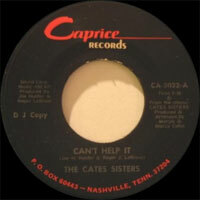 1977 SP CAPRICE 2030 (US) The CATES - Out Of My Mind / ? 1977 SP CAPRICE 2032 (US) Can't Help It / ? 1977 SP CAPRICE 2036 (US) I'll Always Love You / ? 1977 SP CAPRICE 2038 (US) Throw Out Your Lifeline / ? 1978 SP CAPRICE 2041 (US) I've Been Loved / ? 1978 SP CAPRICE 2047 (US) Long Gone Blues / ? 1978 SP CAPRICE 2051 (US) Lovin' You Off My Mind / ? 1979 SP OVATION 1123 (US) The CATES - Going Down Slow / ? 1979 SP OVATION 1126 (US) The CATES - Make Love To Me / ? 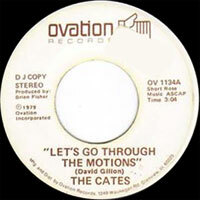 1979 SP OVATION 1134 (US) The CATES - Let's Go Through The Motions / ? 1980 SP OVATION 1144 (US) The CATES - Gonna Go Through The Motions / ? 1980 SP OVATION 1155 (US) The CATES - Lightnin' Strikes / ?